One of the perks of working here at Domino is the fact that we get access to a myriad number of homes, all beautifully individual and dynamic. And with said perk, we spot commonalities along the way. There are a handful of trademark trends we have grown to expect every season: pastels for spring, vibrant hues for summer, and cozy textures for fall. Then there are those that skew toward the less-expected and seasonless. Case in point? Oversized red couches. A departure from the standard beige/black/brown sofa, this fresh alternative immediately brings a bold dose of color and character to any space. Spanning the color spectrum—from tomato to rust—the red couch trend is big in every sense (think: chic sectionals and ultra-plush designs). 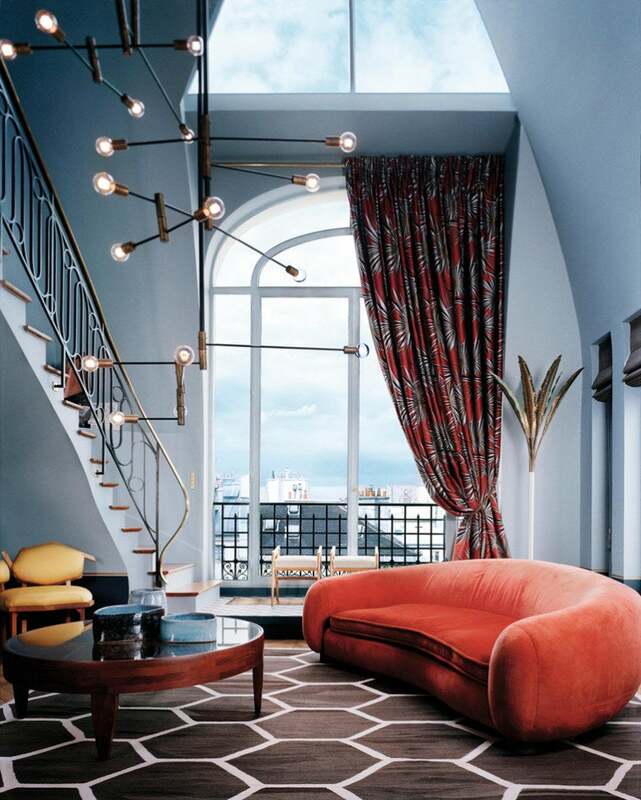 Elevating already statement-worthy spaces to new levels—see: this Parisian home, where the saturated sofa is complemented by brass accents and soothing shades of blue—the look is surprisingly versatile and can be seamlessly integrated within a wide variety of aesthetics. They say two makes a trend, so consider this it. We were absolutely enamored with the iconic sectional in this Williamsburg row house. Its French-tufted mattress-inspired design beautifully plays up the palette of moody reds and deep burgundies—not to mention the fact that its modular form results in a highly-customizable configuration. Complemented by grounding neutrals and a handful of decorative textiles and accessories that share the same pop of color, this living room is pure perfection. Want to recreate the look at home? Ahead, we rounded up the best red couches to spice up any space. Go modular with this two-tone take on the living room staple in an artful color block. This plush sofa is the epitome of comfort and modern elegance. Bold and dynamic in color, it’s the ultimate living room statement piece. Regardless of the season, we’ll never tire of a velvet couch, especially one that comes in just the right shade of crimson. This timeless piece will never go out of style, thanks to its effortlessly chic build and refreshingly simple, retro-inspired finish. Form and function join forces, resulting in an iconic statement piece that will instantly transform your living space. The two-piece sofa’s deep-seated form means endless lounging with the ultimate level of comfort. Lacking frills, its streamlined structure requires very little when it comes to decorative layers or additions. Add on a throw pillow or two—high-contrast hues encouraged—and call it a day. Functionality is a mindset—or so we would tell ourselves in an effort to justify splurging on this stunner. Designed by Sacha Lakic, this 4-seater invites an untraditional approach to a traditional piece, proving that even a living room staple as simple as a sofa can double as an artful accent. A bit more structured and not quite as saturated, West Elm’s take on the trend is earmarked for the urban dweller who is short on space. Its streamlined frame coupled with the deep-seat cushions provide the contemporary form with a much-needed element of coziness. Pair the piece with a subdued flat weave rug and neutral accents. This L-shaped sectional is all about comfort and elegance. From the lateral stitching to the luxe effect of the fabric, and down to the black metal legs, no detail goes unnoticed with this one. Contemporary yet classic, it can fit right in with a wide array of decorative aesthetics. Ikea’s budget-friendly version of the best red couches comes in the form of a saturated red sofa with deep, comfortable cushions. Outfit the couch with throw pillows of a contrasting hue, skewing towards the more geometric, to complement its structure with a contemporary touch. A low-set adaptation of the classic Chesterfield sofa, this elegant piece brings a slightly orange tint to its bright red, velvet upholstery. This story was originally published in March 2018; it has been updated with new information.